Chef David’s birthday is the perfect opportunity to celebrate the life of Tony Roma’s original chef, and his innovative spirit, by giving our fans the chance to enjoy his most iconic dish. Romacorp, Inc., parent company of Tony Roma’s®, honors the late Chef David Smith and celebrates why he’s such a legend in the first place – for developing Tony Roma’s world-famous Baby Back Ribs and popularizing its signature ribs around the world. Chef David’s passion for the grill and dedication to satisfy the cravings of guests paved the way for Tony Roma’s global growth and made the brand a household name in over thirty countries around the world. 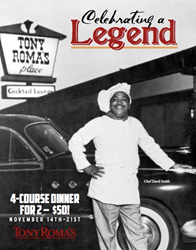 November 14th is Chef David’s birthday, and to celebrate his birthday and his legendary impact on mainstream dining, Tony Roma’s will offer fans in select USA locations the chance to enjoy a special limited-time, $50 four-course “Master of the Grill” menu for two, highlighted by Tony Roma’s mouthwatering Original Baby Back Ribs. At Tony Roma’s locations in Orlando, FL, Sunny Isles Beach, FL, and Doral, FL, customers who order a full rack of Tony Roma’s Original Baby Back Ribs can “Raise a Glass” to celebrate Chef David’s birthday by selecting from their choice of a free Sam Adams draft beer, house wine, Classic Romarita®, or soft drink. These special offers are available for Tony Roma’s fans from November 14 to November 21. The story goes like this – in 1972, a man named Tony Roma decided to open a bar in North Miami, and he hired David Smith to be his chef. One day, David threw some ribs on the grill, slathered them with a special BBQ sauce he made from scratch, and a legend was born. It was that innovation that built the foundation of the Tony Roma’s brand and led to the popularization of American-style grilling and ribs around the world.